Ganymede is a satellite of Jupiter and the largest moon in the Solar System. 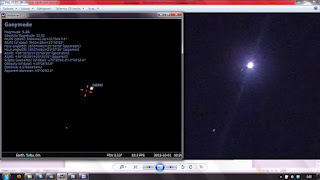 It is the seventh moon and the third Galilean moon outward from Jupiter. 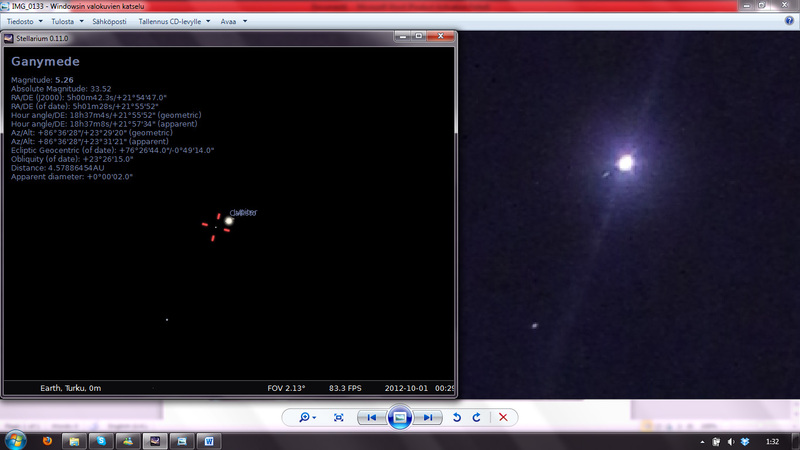 The image you can see is of Jupiter and its moon Ganymede that is just beside it. ( right side: Photo / left side: Stellarium Star map). The lower "dot" is Iota Taurus, a star in the constellation Taurus and an outlying member of the Hyades star cluster. This photo has been taken with a 40 mm lens on a canon 550D in a city lighting. Ganymede is Completing an orbital period of 7,15455296 days, so next Monday the planet should be at the same spot. Therefore I will try to photograph the Planet and moon and see if it is at the same spot. These pictures are crude, but none the less fun and accurate and could be interpreted as an exoplanet orbiting it's host Star. This open debates and helps to imagine ways to see other world around parent Stars, in this case the planet Jupiter. Ganymede has a diameter of 5,268 km (3,273 mi), 8% larger than that of the planet Mercury, but has only 45% of the latter's mass. Its diameter is 2% larger than that of Titan, the second largest moon. It also has the highest mass of all planetary satellites, with 2.02 times the mass of our Moon. Many probes flying by or orbiting Jupiter have explored Ganymede more closely, including four flybys in the 1970s, and multiple passes in the 1990s to 2000s. The most recent spacecraft to explore Ganymede up close was New Horizons, wich passed in 2007 on its way to Pluto. New Horizons made topography and composition maps of Ganymede as it sped by. Next Monday I will attempt to photograph Jupiter and confirm (or not) that in fact Ganymede is orbiting it's host planet in roughly 7 days. Stay tuned! Images: Jupiter and Ganymede Credit: Astronomy Club Toutatis, animation of the Laplace resonances of Ganymede, Europa and Io. It's snowing in Finland, White Turku!